A powerful explosion rocked Jaffa, the southern part of the Israeli city of Tel Aviv, causing a building to collapse and triggering a massive fire. Three people have died in the incident, police say. City police confirmed the three deaths in a Twitter post on Tuesday, contradicting overnight reports of four casualties. Two of the victims died at the scene, with another pronounced dead in the hospital, according to local media.One person is said to be critically injured and another four suffered minor injuries. The initial explosion, at about 11:10 pm local time (21:10 GMT), was heard as far away as central Tel Aviv. It was not immediately clear if anyone remained trapped in the collapsed building, which reportedly used to house a construction supplies store. Local media reported that screams could be heard under the debris of the building. 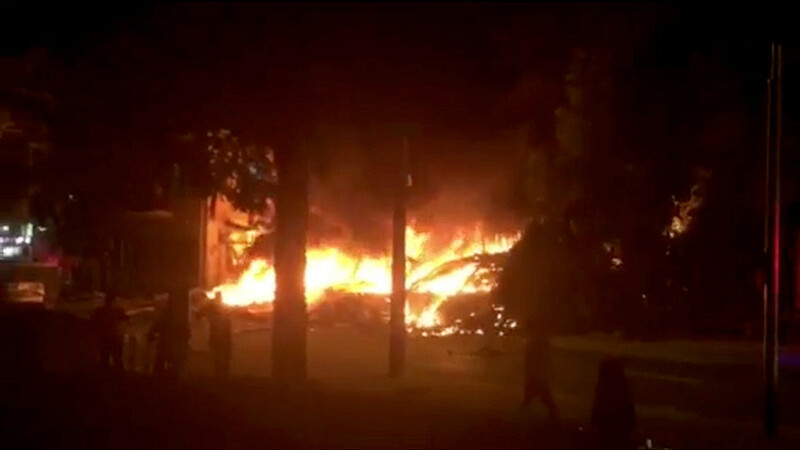 The blast was so powerful that debris was scattered to nearby streets, with fire engulfing cars parked in the vicinity. The cause of the blast and subsequent fire is still being determined. A preliminary investigation indicated that the source of the explosion might have been in a hardware store next to the building, Arutz Sheva reported, citing police. I24news reported that the fire was likely sparked by flammable materials kept in the paint shop located in the building.